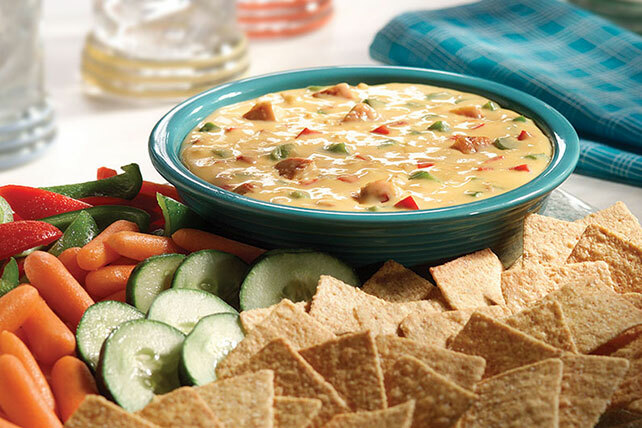 Wow your diners with the VELVEETA Easy Cheesy Fajita Dip appetizer. You know they like cheesy chicken fajitas, so its a pretty good bet they'll like VELVEETA Easy Cheesy Fajita Dip, an easy and hot appetizer, too! Microwave all ingredients except sour cream in large microwaveable bowl on HIGH 6 to 8 min. or until VELVEETA is melted, stirring after 3 min. Serve hot with crackers or assorted cut-up fresh vegetables. For a little heat, stir in 1/2 tsp. crushed red pepper before microwaving. Makes 3 cups or 24 servings, 2 Tbsp. each.